Normally our co-conspirator Jeff Smith would be guest-blogging to fill in background on his new installment on the Criterion Channel. That entry is devoted to Fassbinder’s great social melodrama Ali: Fear Eats the Soul. But Jeff is ramping up for the start of a semester, and we’re hustling to get ready for a trip, so let this notice do duty. 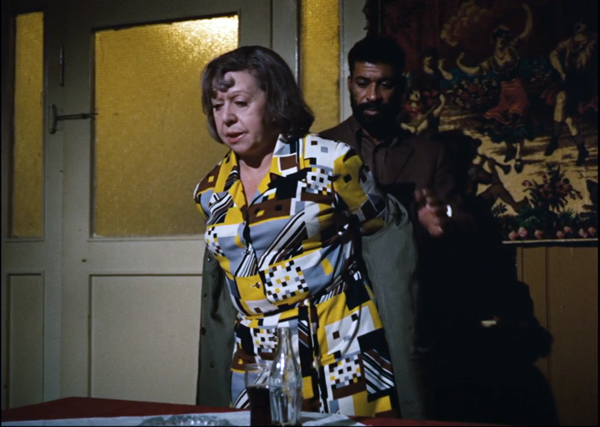 In this month’s entry, Jeff digs deep into Fassbinder’s directorial style and shows how it connects to the film’s portrayal of bigotry–ethnic, racial, age-related. Since at least Katzelmacher (1969), and right up to Querelle (1982), Fassbinder was constantly experimenting with performance and staging. Ali is one of his triumphs. Jeff is especially acute, I think, in showing how before-and-after parallels in the drama emerge from shrewd repetitions of compositions and mise-en-scene. Thanks to the boffins at Criterion, these become crystal-clear through judicious split-screen. Jeff’s entry is one of our very best, and we hope subscribers to FilmStruck and the Criterion Channel will enjoy it. The transfer is very pretty too. Coming up in future months: entries on M, The Phantom Carriage, Brute Force, and Chungking Express. “The thirteen feature films already produced and screened during the first four years of the Biennale College Cinema program have met with acclaim throughout the world. Produced on an ultra-modest budget, each of them showed an unusual talent and an innate gift for filmmaking,” notes moderator Peter Cowie (film historian and former Int’l Publishing Director of Variety). “The Biennale College Cinema scheme is exciting chiefly because it is in essence a workshop – a workshop and laboratory that places the focus squarely on two essential themes: the making of low-budget films in a period of global recession, and the need to find youthful auteurs if the cinema is to be reinvigorated.” The laboratory was created by the Biennale di Venezia in 2012 and is open to young filmmakers from all over the world. This is very exciting. And while we’re in Venice, we hope to reconnect to old friend Mark Johnson (producer of innumerable outstanding films, including Rain Man, Logan Lucky, and Galaxy Quest) and newer friend Alexander Payne. They’re arriving with Downsizing. Many other major films will be there, and we hope to report on some of them here over the next two weeks. And then there’s some scary Virtual Reality…. Thanks as ever to Peter Becker, Kim Hendrickson, Grant Delin, and all their teammates at Criterion. A complete list of the Observations on Film Art series (ten already!) is here. Videos of earlier Biennale College Cinema panels can be found here. Glenn Kenny discusses last year’s event on RogerEbert.com. Our own efforts at split-screen analysis yielded a comparison of the murder and its replay in Mildred Pierce. You can see that here, and the accompanying blog entry here. Ali: Fear Eats the Soul.